Go Ahead, Laugh it Off. Invoking The Power of Laughter. 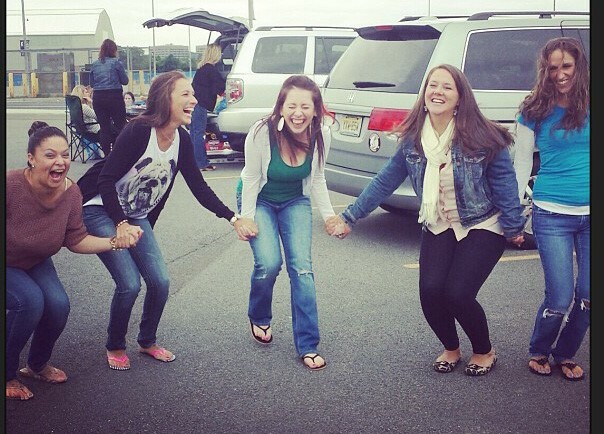 When is the last time you laughed? I mean really laughed – to the point where your stomach hurt, your eyes teared and you couldn’t breathe? It feels good, doesn’t it? Laughing like that reminds me of my cousin, Leyla, who moved to Wyoming about five years ago. No matter what the occasion, we would always find a reason to join together in a roar of laughter. I’m almost certain that we found the work “fork”’ ragingly funny at one point and, mind you, this was during our pre-wine days. Anyway, those who really know me understand that I love to laugh. If you had a chance to read my post on “Normalcy,” you would know that I have a high pitched one (laugh, I mean), which I seem to utilize at the most inappropriate times – when a room is silent, for example. But for a few seconds or (if I’m lucky) a few, long minutes, laughing makes me forget about work, about responsibilities, about where I am or what I have to do. In that stomach-hurting-eye-tearing moment, I am the happiest version of myself. This is a picture of my girlfriends and me two summers ago at the Jon Bon Jovi concert. That’s me in the white sweater. As you can see, I am in the middle of one serious chuckle. Just looking at this picture makes me smile. Laughter is powerful, and notably a tool that we too often underestimate. Have you ever read into the benefits of laughing? Research suggests that it can strengthen the immune system, improve cardiac health and lower blood pressure. Even forcing yourself to laugh is said to reduce stress and improve your mood. Yeah, so that sounds great. Where can I sign up? Of course, as is life, the answer isn’t simple. Sure, it’s easy to laugh in response to something funny or when things are going splendidly well. I have mastered that art. But can laughter really help us through tough times? If you, like me, ever found yourself in a rut impossible to crawl out of, you are probably skeptical. Here’s the question I ask myself when things are going terribly wrong: How can you expect me to laugh at times when all I want to do is cry? To me, the actions of laughing and crying lie on opposite ends of the spectrum of emotional reactions. On one end, you have the ultimate in happiness and on the other, the ultimate in sadness. With that said, I tried to think back to a time during which I felt absolutely horrendous, yet somehow successfully substituted crying with laughter …and then I remembered the following example. A few years ago, on a cold day in February, I traveled to Whippany, New Jersey to take the New Jersey Bar Exam. I had been studying for months, pouring my heart and soul into preparing for a two-day exam that was bound to change my life. 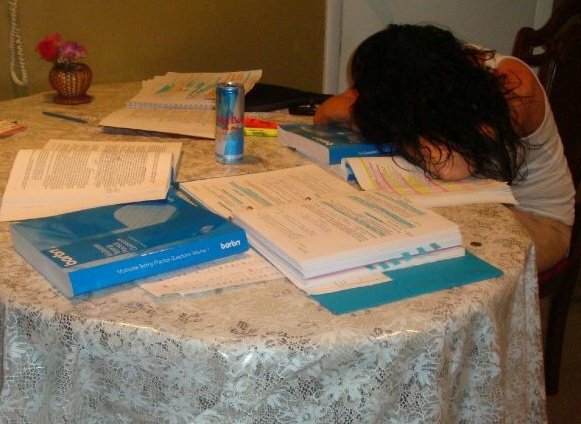 My mother took this picture of me studying for the Bar Exam. Even the Red Bull couldn’t keep me awake. On day one, I arrived at the test site and found my assigned seat among thousands of others. The test was about to begin, so I decided to use the restroom one last time. I was wearing divinely comfortable drawstring yoga pants (You may wonder why this detail is relevant, but I promise it bears great significance so keep reading). When I finished my business, the drawstring on my pants gave out. In other words, my pants broke. Just like that. With only a few minutes until show time, I needed to conjure up a creative way to (literally) pull myself together. Naturally, I tucked my pants into my underwear, hoping like hell that this would hold them up, and walked back into the exam room with a slow, uncomfortable shuffle. On top of that, an unexpected blizzard commenced which necessitated an overnight stay at a local hotel. The only available room was in a not-so-pleasant motel, which stunk of an undefinable odor I would rather not recall. On top of that, I had another day of a tortuous exam to look forward to. I was buried underneath a mountain of stress and all I wanted to do was crawl up into a ball of misery and cry. The only consolation was that I had just ordered delicious, cheesy pizza for delivery. Now, any established pizza lover will understand that, when you are hungry, pizza tastes even more amazing …and I was famished. I waited for what felt like eternity for that delicious pie of cheesy heaven to walk into my room and save this horrendous day. But when the delivery man knocked on my door two hours later (yes, two hours), I bit into that ice-cold pizza and I laughed, and laughed, and laughed. And do you know what? It worked. I felt noticeably better! I guess the bottom line is that there’s no law against crying when you really need to. Sometimes, you just need to. However, maybe it is possible to maintain a healthy balance between the two; laughing and crying, I mean. Here’s a quote by Veronica Roth from “Divergent”: “Sometimes crying or laughing are the only options left, and laughing feels better right now.” So when we have the option, how do we choose the latter? Maybe it’s by not taking ourselves too seriously. When you fall in public or otherwise embarrass yourself (as I often do), choose to laugh it off. We all fumble and fall. Maybe it’s by appreciating the story we will tell after things go terribly wrong. Hey, I passed the Bar Exam and now have this slightly and moderately entertaining story to share. Maybe it’s by finding your personal funny trigger when you are having a feel-like-crying kind of day (i.e. comedic movie, funny YouTube video, silly memes, etc.). Maybe it’s by appreciating the bigger picture; by remembering that tough times are fleeting and even the darkest days give way to the sun. Did your pants break? It’s okay. Did your car break down? It’s okay. Need a root canal? Missed your bus? Failed an exam? Lost your job? It’s okay. Do you know why? Because the bigger picture is, you are alive. I sure don’t have all of the answers. But what I do know is that being alive – that is reason enough to celebrate living … and laugh while doing it. 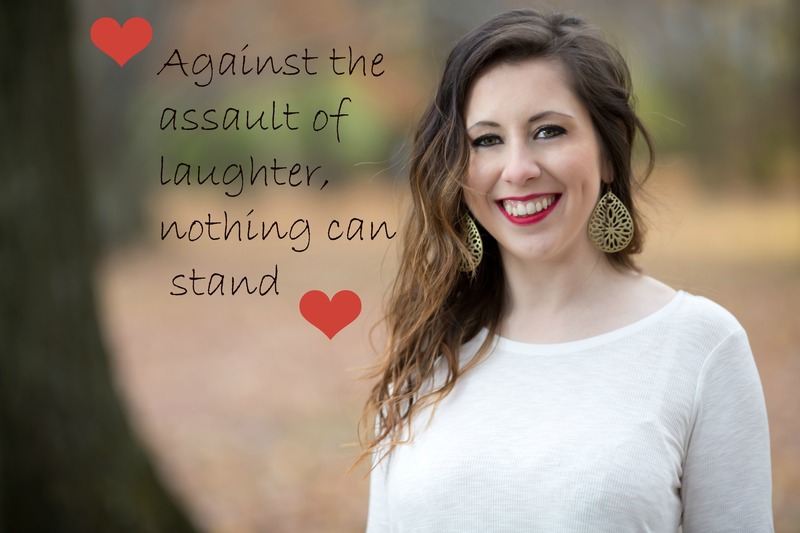 Have you ever successfully invoked the power of laughter during tough times? Did it work? Whenever we laugh, there is the state of no-mind, and people really loving it. Jade, that is very true. You should definitely try to find more funny triggers so that you can laugh for even more hours 🙂 Thank you for reading! I love your blog so much I’m so happy I came across it. The way you say things is so relatable and funny. I haven’t laughed hard in a very long time but after reading your blog I really do miss it. Isn’t it laughter is the medicine? Thanks for writing and keep it up! Aw, thank you, Mandi! That means a lot. You are so right. Laughter really is the best medicine. Thank you for reading! Just reading your post brings a smile and a little laugh. When I’m tired and just want to go to bed, but can.’t because i still need to put my kids to bed and do a little house work, I want to cry. Lately my husband and I been watching with the kids before their bed time Americas funniest home videos. Our family gets to roaring with laughter. I get energized and putting the kids to bed and doing nightly chores don’t seem so bad after all. Thank you, Lisa! I am so glad that you enjoyed the post 🙂 I think America’s Funniest Home Videos is a perfect funny trigger – so glad that you found your own to help you through the extensive tough mommy duties! I love laughing too. My laugh is more deep and hearty and usually preceded by a sharp psst of expelled breath. I often laugh during quote-unquote “inappropriate” situations as well, like when something serious happens. It’s nervous laughter. I’ve read, though, that this is the body’s attempt to relieve stress, which, to me, makes it not that bad. And it does seem to help, even if it sometimes substitutes the stress for that of feeling people’s disapproval over my laughter. I also heard somewhere that every time you laugh, it adds eight minutes to your life. And that it’s a great abdominal workout!